Subatomic Studios announced that they have submitted version 1.2 of Fieldrunners [App Store, $4.99] to the App Store and should be available in the next few days. The update offers a number of new features, including a new Map, Tower and Fieldrunner. Flame tower. The flame tower is capable of incinerating multiple fieldrunners in a single fiery swoop. Sell without penalty. A tower that is both purchased and sold while the game is paused will not incur a score or price penalty. Faster load times. The time required to start a new game or resume a previously saved game has been significantally reduced. Updated game icon. The game icon has been changed to reflect the color palette of the new map. Improved lightning visuals. The lightning bolt discharged by the tesla tower now emits light and animates more realistically. New map in v1.2: Drylands. With multiple paths snaking thru the dried-out canyon riverbed, it gives the fieldrunners ample chance to escape. New Fieldrunner in v1.2: the P-47 Thunderbolt. These blazing fast planes tear through the sky over the fields at an incredible speed. Autosave. The autosave feature saves your progress every round to protect you against crashes or freezes. 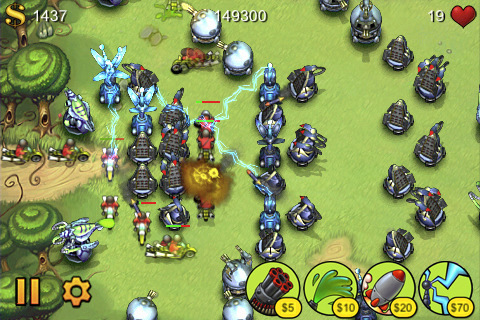 Fieldrunners is one of the most popular Tower Defense games on the iPhone and was named amongst Time Magazine’s Top 10 games of 2008. Next PostNext Apple to Open $19.99 Premium Games Section?